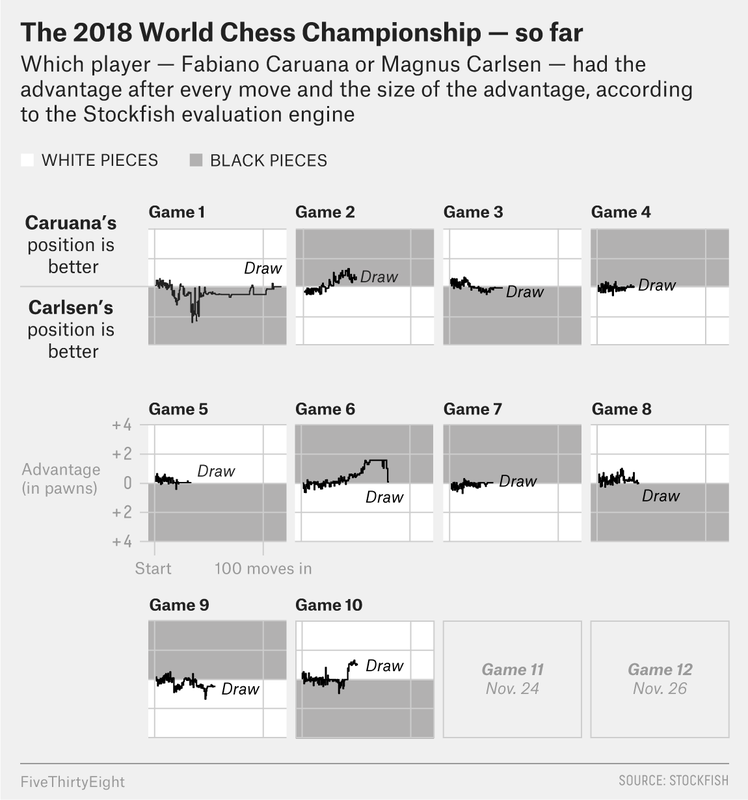 Magnus Carlsen and Fabiano Caruana, the world’s top two grandmasters, spent Thanksgiving in London in a soundproof glass box, staring at a small table, guzzling bottled water and continuing their deadlocked battle for the World Chess Championship. The match was already a record-breaker, having started with more consecutive draws than any championship on the books. As the holiday began, the best-of-12 race for the title sat level 4.5-4.5. Tensions ran high. #LooksDrawish was trending on Twitter (I assume/dream). I awoke in my Brooklyn apartment early Thursday morning, put on some heavy-duty coffee and watched as the grandmasters opened Game 10 with another Sveshnikov Sicilian, just as they’d done in Game 8. Caruana steered out of Game 8’s lane on his 12th move, with a novel “pawn to b4,” and they were left with the position below. “It’s going to be a complicated game,” said the grandmaster Judit Polgár, providing the official match commentary. And indeed it was going to be — for the players and your humble chess correspondent. My parents were in town, my sister was sweating over an oven, and forgotten provisions had to be procured. A table had to be set. Mashed potatoes had to be eaten. I tore away from the match and headed into the city. So just what was it that Carlsen did with the black pieces here? It was pawn to b5. Erwin l’Ami, the grandmaster who called it “incredible,” described the idea behind the move, which ostensibly loses a pawn for Carlsen, as follows: Once Carlsen pushes that pawn to b5, Caruana can win it by moving his pawn to b6. (That may not appear to be a legal move, but it’s a special capture known as en passant, in which a pawn can diagonally capture another pawn that has just hopped up two squares next to it.) Carlsen could then take the rook on a3 with his rook, and Caruana could take that rook with his knight. Carlsen could then push his pawn to f3, encroaching further into white’s territory. Two pawn captures then ensue on that same square, followed by Caruana capturing there with his bishop. And then Carlsen could bring his knight into the action on e5. The result of that hypothetical line would have looked like this — a “huge attack” on Caruana’s king. After snacking nervously with this chess idea in our heads, my parents and I emerged from a serviceless restaurant worried (or at least I was) that we may have missed the final Norwegian triumph and the de facto end of the world championship. Someone may have won! We found instead that we hadn’t missed many moves and that Caruana hadn’t bit on Carlsen’s aggressive pawn sacrifice. No devastating attack had come. The position (my phone told me) was once again level. It looked drawish. Wine store: drawish. Whole Foods: drawish. Elevator: drawish. When we arrived at last at my sister’s apartment, her boyfriend already had both the chess game and the football game on large screens, thereby forever cementing his value to the family. He’s not much of a chess player, but he did have some interesting thoughts on rook endgames. Lucky thing, too, because by that point the game looked like this. With my attention divided between how-to-carve-a-turkey videos on YouTube, a glass of Cabernet, and the soundproof glass box in London, I was nevertheless unsurprised to see Carlsen and Caruana shake hands for the 10th game in a row, agreeing to a draw on the 54th move. The match — needless to say — sits level at 5-5 with two games to go. Brin-Jonathan Butler, a Canadian journalist who was therefore presumably unencumbered by Thanksgiving, had been keeping a close eye on the match and called me to say that it has been “as eventful as a bus keeping its schedule.” And indeed, that schedule continues: Game 11 begins Saturday at 3 p.m. Greenwich Mean Time — that’s 10 a.m. Eastern. I’ll be covering it here and on Twitter.